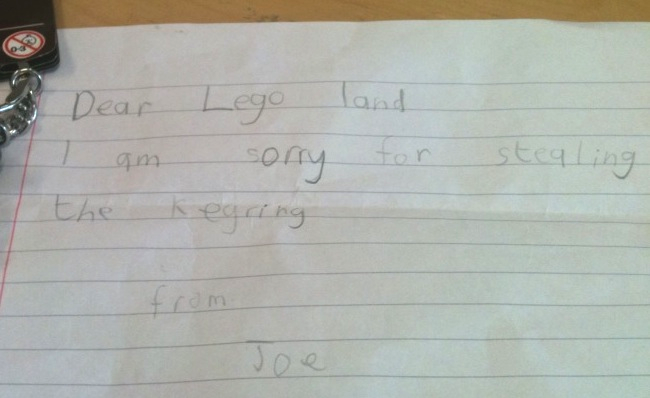 Neil Crittenden, General Manager of the LEGOLAND Discovery Centre said: “We would like to say thank you to Joe and reward him for his honesty. We were so touched by the letter that we would like to invite Joe back to the Centre with his family to enjoy a day out as our guests. Whilst we of course do not condone what Joe did, returning the keyring proves that Joe has learnt a lesson, and we’d like the opportunity to meet him to praise him for admitting his mistake and for taking action to resolve his actions. If anyone knows who Joe is, then please can they get in touch with the team, ldc@brazenpr.com, or call the Centre directly, identifying what type of keyring Joe returned.